Last weekend, Australian genealogist, Jill Ball, of the blog Geniaus, created a meme related to things we as genealogists accomplished throughout 2012. The intent is to focus on the POSITIVE…what we did accomplish…and not the things we may have fallen short on. It’s all about perspective. In fact, that’s about how I approached my 2012 Achievements post; while I didn’t exactly accomplish what I initially set out to do, I highlighted many of the things I did accomplish, even though they weren’t my original 2012 goals. In that post I listed several things, but it did not include many of the things on Jill’s meme list. That being said, this is why I am writing this post. I encourage you to participate too, just so you can see how much you actually did accomplish in 2012. 1. An elusive ancestor I found was Mary (Nevens) O’Brien. Mary isn’t exactly an ancestor, but she’s likely family. Let me explain. According to family lore, my second great-grandmother, Margaret Millet, had left Ireland, lived in New York for a short time, and then went to live with “family” in Bristol, Illinois. Next to that note in parentheses was the surname O’Brien. For the last two+ years, I’ve had no idea who this O’Brien family was or how they were related, but that changed a few months ago. Back in September, I was working on Margaret’s Irish clan and a chance encounter of the name Anna Millett in the Illinois death index on Ancestry made me curious. I looked at the indexed record, which was pretty detailed (I now also have the actual certificate) and Anna Millett, born in County Kilkenny, Ireland, was listed as the mother of Mary (Nevens) O’Brien. Mary was listed as being born in Bristol, Illinois and she died in the next county over. Along with some additional research, I’m now working with the assumption that Mary O’Brien is the “O’Brien family” that Margaret went to live with. I also think Mary’s mother Anna is the sister of Margaret’s father John, but I need to do some more digging to prove that. Even if they are not siblings, it’s reasonable to assume they’re related somehow. 2. A precious family photo I found was among a batch of photos my Godmother sent me a few weeks ago. There were handful of photos, all of which I already had, except for three. The three photos are from the same event and I had never seen them. I believe they are from my Godmother’s niece's birthday party. The caption on the back, probably written by my Godmother, was: Marie, Jean, Joe, Julie, Rachel and Grandpa. I would be the baby in the blue party hat, held by my dad, next to my mom. 3. An ancestor’s grave I found was completely by chance. About a month ago, I received a change request for a Find A Grave memorial I had for my fifth great-grandmother, Sarah (Norton) Webster. The request asked me to add her father Solomon Norton to the record so they could be linked. What?!? There was a memorial for Solomon Norton? As it turns out, yes there is, but I hadn’t looked for one since 2010 and the memorial was created in 2011. Not only was there a memorial, but there was a photo of the gravestone, which had an exact death date and included a second wife…this was completely unknown to me (and probably everyone else because no one has this second wife in their tree). You can read more about my Solomon Norton research in a recent post entitled Dear GeneaSanta, How About Some Research Help. 4. An important vital record I found was clearly the one I discussed in #1. But, in addition to that, I have spent some time working in the civil registration records for my Luxembourg family. Fortunately the images are all on FamilySearch (although not indexed) so I can take my time and collect all the records for the surnames of interest. All of the records go into a spreadsheet so I can keep track of the locations searched, what was found, and eventually determine who is family and who is not. 5. A newly found family member who shared their direct line to our common ancestor, Governor John Webster, was Jana Last. Jana authors the blog Jana’s Genealogy and Family History Blog. I’ve also enjoyed reading her Webster posts on her blog. 6. A geneasurprise I received was being able to visit my mom for the holidays. I haven’t been to visit her since 2008, so my husband decided to use his bonus to pay for the trip. It was nice to hang out with my mom for a few days and realize how much I miss her and her cooking! 8. My 2012 blog post that received a large the most number of hits or comments was Using the Kindle Fire for Genealogy – Ancestry. I have plans to revamp this post to bring it up to date since a lot has changed since I wrote the post back in April. 9. A new piece of software I mastered started to experiment with was RootsMagic. Don’t get me wrong, I love Legacy Family Tree and have been using it forever, but there are some features in RM that I really like…if only I could blend the two…. 10. A social media tool I enjoyed using for genealogy was Facebook. I’ve been on Facebook since 2008, and while I keep up with my friends and family, probably 75% of my friends are genealogists. I’ve even made some new friends this year and when I ran into an issue on how to handle an adoption case, I knew exactly who to contact. Without Facebook, I wouldn’t have known who to turn to for advice. 11. A genealogy conference from which I learned something new was the Tazewell County Genealogical Society’s fall conference. Carol Whitton was the speaker for the all-day event and she presented two lectures related to German genealogy: Using and Understanding the German Gazetteer, in which she discussed how to use the Meyers Orts- und Verkehrs-Lexikon des Deutschen Reichs and Reading German Church Records. Both were extremely helpful and the minute I got home, I got to work. I wrote two blog posts related to what I learned and I’m sure I’ll have more in the future: My Adventure With Meyers Gazetteer and When In Doubt, Map It. 12. I am proud of the presentation I gave at presentations I arranged for both the 2012 and 2013 Illinois State Genealogical Society’s webinar series. This program is very dear to me and I am fortunate to have met some wonderful genealogists who were thrilled to provide presentations for us. 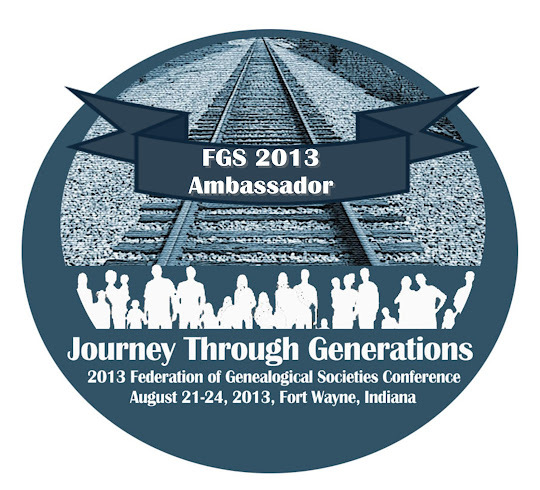 It’s a huge benefit to ISGS members and the genealogy community as a whole. Be sure to read my posts A Look Back at the 2012 ISGS Webinar Series and Illinois State Genealogical Society Announces Its 2013 Webinar Lineup. 14. I taught a friend how to get started in her family history research. Literally the day before I left for my holiday vacation, a friend emailed me asking how to get started…cheaply. As we all know, that’s quite a complicated question to answer. I gave her some simple advice on collecting all of the family-held documents and talking to her mom and other relatives to pull together some basic information. She’s a computer geek like me, so I suggested two genealogy databases to try out so she could start entering information to help her stay organized. I then suggested a few books for her to read so she can figure out what approach she wants to take based on what it is that she wants to know/do. And of course I’m always here for her if she has questions. 15. A genealogy book that taught me something new was Luxembourgers in the New World by Nicholas Gonner. There is a lot of great information in the first volume of the book, which I desperately want a copy of (I didn’t get to spend too much time with it at the Family History Library when I was there last February). Volume II contains an index of names found in the Luxemburger Gazette, which was published in Iowa from 1871-1918. Did I mention that I really want a copy of this two-volume set? 16. A great repository/archive/library I visited was the Family History Library in Salt Lake City. I was able to get in plenty of time at the FHL while attending RootsTech 2012. I made some great discoveries that included finding records from my second great-grandmother’s home town in Prussia. 17. A new genealogy/history book I enjoyed was The Last Queen of England, by Steve Robinson. It’s a fiction book where the main character is a genealogist. This book was released a few weeks ago and is the third in a series. They’re all fantastic books…I highly recommend them. 19. A geneadventure I enjoyed was helping a friend by tracking down her birth mother, which ended in a very happy reunion. This is the first adoption case I’ve attempted (outside of my stepfather’s case) and I am happy that everything worked out…I know this isn’t always the case. 20. Another positive I would like to share is that I plan to keep truckin’ along and fill 2013 with many accomplishments. Here’s to a new year, cheers! So sorry to hear about your meet up with the asphalt. I'm sure that was an encounter you wish had never happened. I hope you feel better soon. Wishing you many more genealogical accomplishments in 2013. Thanks, Julie, for your detailed responses the the Geneameme. I get such a buzz from reading the stories my genimates have to tell. You have a right to be proud of the webinar series. I have actually tuned in to one or two from Australia and enjoyed them greatly. What a year, Julie! Thanks for sharing it--not only in this GeneaMeme recap, but in your posts throughout the year. How fun that you and Jana turned out to be distant cousins! So glad, also, that you got to make the trip to visit your mom. There is nothing like getting to go back home for the holidays.